According to this theory, about 5 billion years ago, shock waves from a supernova disrupted a nearby nebula. The nebula began to rotate, and gravity pulled more and more matter into a central disk. That central disk became the sun. 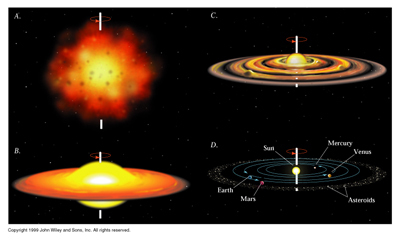 Clumps of gas and dust formed around the central disk. They would from the planets and other objects in the solar system.